I never thought I’d write a book about birds. Then I started teaching sixth grade English, and I was thrown into a cross-curricular research project on North American birds. Over several years, my students and I came to appreciate birds and their various behaviors, quirks, and personalities. I was writing a lot during this time, but then one day I thought to myself, “What if there was a boy who couldn’t find a bird? What if he searched for this bird every day, like his life depended on it?” A couple of years later, after hundreds of hours of research, pouring over field guides and websites, I finished a book called BIRD NERD. Which then became MIGHT FLY AWAY. Which then became what it is now: SOAR. Seventh grader Eddie is determined honor his father’s legacy and win the school science fair in this fun and quirky debut novel. Eddie learned everything there is to know about birding from his dad, including the legend of the golden eagle, which Dad claimed he saw once down near Miss Dorothy’s pond. According to his dad, the golden eagle had wings wider than a creek and talons the size of bulldozer claws. But when Eddie was in sixth grade, Dad “flew away” for good, leaving Eddie on his own to await the return of the elusive raptor. Now Eddie is starting seventh grade and trying to impress Gabriella, the new girl in town. The annual seventh grade Science Symposium is looming (which Dad famously won), and Eddie is determined to claim the blue ribbon for himself. With Mr. Dover, the science teacher who was Dad’s birding rival, seemingly against him, and with Mouton, the class bully, making his life miserable on all fronts, Eddie is determined to overcome everything and live up to Dad’s memory. 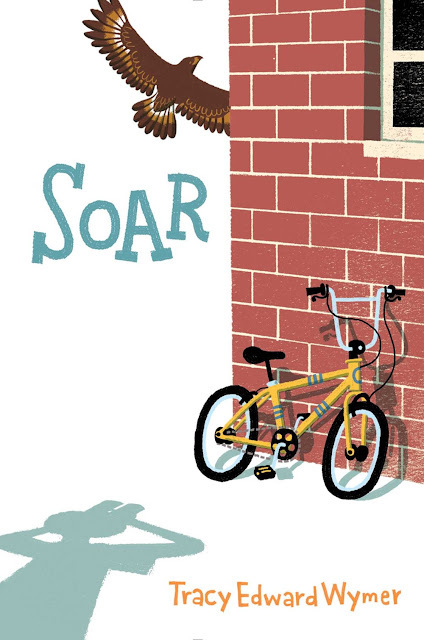 Can Eddie soar and make his dream take flight? TracyEdward Wymer is the author of middle grade books SOAR (S&S/Aladdin, Spring 2016) and THE COLOR OF BONES, and he is part of the anthology BEEN THERE, DONE THAT (Penguin 11/3/15). When not plowing through stacks of books on his nightstand, he likes to run, write, and root for the Kansas City Royals. He lives with his family in Los Angeles. Thanks for sharing! Excited about your new book coming out. The cover looks excellent - clever to use the shadow of the boy and the bird just barely slipping out of our grasp. This sounds fantastic, and I love the back story. Thank you for this post and introduction to SOAR!